You got a lot to do. You can’t do everything you’re supposed to do to market your business; and sometimes it’s hard to know what really matters. Let me share with you four content marketing tips I learned as a tour guide. I had to guide 14 tourists through China. On my own. For four weeks. I had been rejected by two tour companies. The third travel agency – the one I ended up working for – never hired tour guides under 25, but they thought I was much older than just 21. Even worse: I had kept something secret. I hadn’t told them I suffered from travel sickness. My first journey as tour guide started badly. I puked on the flight to Hong Kong. Hugely embarrassing. Ever met a tour guide suffering from airsickness? I don’t think my bosses at the travel agency ever found out. Nobody told them. Because somehow things got better during that journey. But what can this teach us about content marketing? Mistakes are part of your content marketing journey. If you don’t want your content to grow stale, you have to experiment from time to time. Occasionally, an experiment fails. Or are you super-human? My huuuge mistake as tour leader – puking on the flight – happened BEFORE I built a relationship with the members of my tour group. They’d only just met me. Fortunately, we were stuck together for four weeks, so I had ample time to turn things around. As content marketer you’ve built a relationship with your audience. Your mistakes don’t matter so much. Apologize if required. And move on. Your core audience are die-hard fans. They’ll forgive you. So don’t be afraid to make mistakes. Content marketing is like guiding your readers through a foreign country. Your readers may not understand the language. They may not know the local habits. On my trip to China I taught people how to use chopsticks. I talked about table manners. I explained how to take a bus. Super-basic stuff. As content marketers we often suffer from the curse of knowledge. We write in-depth posts; and we forget to share basic stuff. 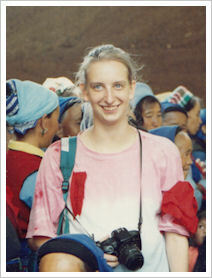 Before my first trip as tour guide I had spent three years studying the Chinese language, history, and culture. Still I was concerned about huge gaps in my knowledge. I didn’t know much, for instance, about Chinese architecture. Did that matter? Of course not. How much you DON’T know doesn’t matter. What counts is sharing what you DO know with enthusiasm. You can’t sell products or ideas you don’t believe in. Your passion sells. Your enthusiasm is at least as important as your expertise. It’s easy to think of big gestures. A big launch. Your best-ever ebook. A guest post on a major blog. But small things can make a massive difference, too. For instance: Giving 14 tourists a pair of cheap chopsticks. Buying a huge watermelon to share. Such cheap treats create a feel-good atmosphere. In a digital world it’s easy to give away stuff and build a loyal audience. What does it cost you to share your expertise? Inspire your audience. Share generously. It’s easy to think of content marketing as one-way traffic. Create content. Write blog posts. Publish ebooks. Develop infographics. Send emails. Post updates. As I learned as tour guide, being interesting is only half the job. Being interested is maybe even more important. Treat your readers as your friends. Ask questions. Find out how they’re doing. Learn how you can help. Be interested. And be yourself – you’re among friends. Are these 5 common beliefs sabotaging your online marketing? Henneke this is an awesome post – I love the point you make about the curse of knowledge and the image of the shared watermelon. Powerful stuff! Great tips , as usual, Henneke! Yay! Love this. Great lessons and a beautiful picture of 21-year-old you! Thank you, Kitty. You’re making me blush! Blush on 😉 and keep on writing about yourself so we really get to know you. Chinese, huh! While being entertained with your China trip mini-stories delightfully alternating with reassuring article writing tips, I received a nifty template for a future article template that now I can’t wait to write. Thank you, Henneke. You’re welcome, Stephen. Feel free to steal the template. 😉 Will you send me a link to your article? I love the visual of a [my] tour guide puking on the plane – aghhh! 🙂 And your story makes your message stick far more than just telling us … Love it! I was concerned that the puking incident might be too graphic, but fortunately my readers aren’t overly sensitive souls. Phew. Not only are these points great for Content Marketing, but also for startup Entrepreneurs! 🙂 I especially liked your note on “art of being interested” ! Good point, Mohammed. I hadn’t thought about it that way, but these lessons are more like life lessons. Interesting. Maybe that’s because content marketing is more about being helpful and being a friend than being a just sales person? Henneke, I love this post. So simple and kind. And helpful. Thanks for including it in our course. Thank you, Irina. This was the first time I introduce metaphors in my posts! Thanks for a very simple but very informative post.